The judge who Donald Trump once said was incapable of rendering a fair verdict towards him due to his “Mexican heritage” will now oversee a lawsuit against a California DREAMer who was deported in February, USA Today reports. U.S. District Judge Gonzalo Curiel will rule on the lawsuit brought by 23-year old Juan Manuel Montes, a California resident who was approved for protected immigrant status under the Deferred Actions for Childhood Arrivals (DACA) program. Montes has lived in the United States since he was nine. Having previously been granted deportation protections twice through DACA, he was picked up by U.S. Customs and Border Protection on Feb 17—despite Trump signaling he would leave the Obama-era policy in place. A federal regulator on Wednesday criticized its oversight of Wells Fargo’s sales practices, saying it failed to act quickly enough once it learned of problems at the San Francisco bank. In a report, the Office of the Comptroller of the Currency said it knew of issues with sales practices at Wells since at least 2010 – six years before the scandal would erupt in September with $185 million in fines from OCC and other authorities. Despite information OCC possessed, including complaints from the bank’s own ethics line, the regulator failed to investigate “root causes,” the report said. There would be no better use of President Donald Trump’s deregulatory zeal than to engineer a wholesale redesign of the crazy quilt of federal agencies that regulate Wall Street and the financial sector, former Fed Chairman Paul Volcker said Wednesday. While everyone complains about the fragmented structure of regulatory agencies, there is enormous resistance to change, Volcker said in a speech to the Bretton Woods Committee meeting in Washington. So far, some 50 efforts have been made since World War II to streamline the agencies but all have failed, he noted. “My point here is to encourage the Congress and the new administration to launch together a serious study of how to deal with the shortcomings of a system which has simply outlived its rationale and its usefulness,” Volcker said. “That indeed is a project worthy of a new administration interested not only in tweaking of oversight and regulatory procedures but rather in simplifying an archaic and unduly complicated regulatory system, a structure that is itself acting as an impediment to efficient and stable markets,” he said. THE FEDERAL RESERVE’S vice chair for supervision is arguably the most important financial regulator in the federal government. No agency has greater oversight responsibility of U.S. financial institutions than the Fed. And the vice chair influences what kinds of trades those institutions can make, how they must prepare for unexpected losses, and what punishment to mete out when banks fail to uphold the law. Hedge funds and private equity firms are sometimes called “shadow banks” because they exist outside the regulatory perimeter, even though they engage in bank-like lending and investment activities. They want to keep it that way. And President Trump’s expected nominationof Randal Quarles to the vice chair’s role is about as close a guarantee as the shadow banking sector can get that the feds won’t be bothering them any time soon. 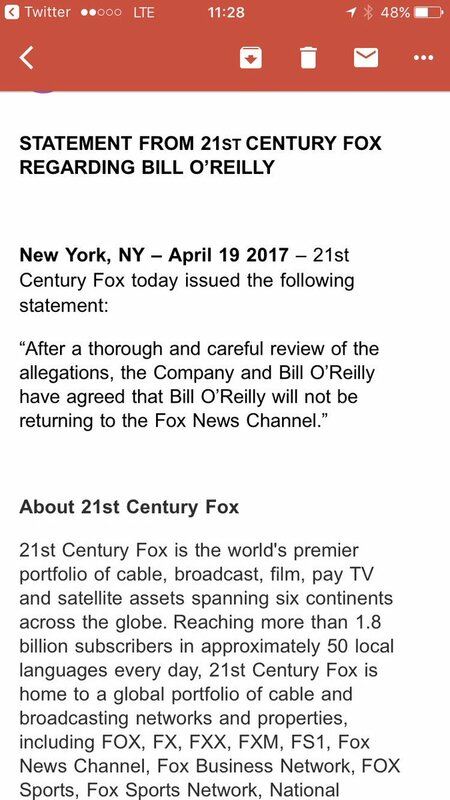 And it’s about time Fox finally send Bill O’Reilly packing!!! Conservative activists and House Republican leaders want to eliminate a trillion-dollar tax break that mostly benefits wealthy filers in Democratic states, a push that could further imperil President Donald Trump’s hopes of winning bipartisan support for a tax overhaul. Ever since the inception of the federal income tax in 1913, taxpayers have been allowed to deduct the state and local income taxes they pay from their taxable income. Anti-tax crusaders, including Grover Norquist, the president of Americans for Tax Reform, say the deduction represents bad policy.